There's a new Samsung Gear VR in town. If you're keeping count, this is now the fourth iteration of the Korean company's Oculus-powered VR headset. Revealed alongside the new Samsung Galaxy Note 7 smartphone, the latest Gear VR is the same price as its predecessor – that's £80. In short, though, this is an extremely similar headset to last year's consumer Gear VR. It's wireless, using your phone to power the VR, comfortable to wear, easy to set up and now has an even larger library of – free and affordable – apps, games and videos to try in VR. In this review we'll let you know our experiences with the differences and additions in the new model, rather than rehash our original Gear VR review. Reviewer's note: On account of the Note 7's current exploding problem, we largely tested the new Gear VR with a Galaxy S6 Edge, which is obviously not the best resolution you can get. Side by side, the new Gear VR looks almost identical to last year's headset. But there are some noticeable differences – the most important of which in our book is the fact that there's more room inside the headset and some new vents on the side. This means we haven't experienced any lens fog so far with the Gear VR (2016), which was one of our main bugbears with the original. Samsung also says it has made it more comfortable and it might be ever so slightly nicer on-face, but the first one was fine so this is pretty minor. It's now an all-black plastic affair and there's a new Oculus Home button next to 'Back' above the trackpad which takes some getting used to, if you've been using the old model and assume there's only one button you can press. But once you're used to it, it's super handy. The trackpad is back to smooth, doing away with the experiment with arrow-like indents. As ever, we'd recommend grabbing a Bluetooth gamepad to use with the headset. Unlike before, the fascia seems designed to only be put in place when there's no phone slotted into the headset. Not that you'd notice but there's also now a thin strip of plastic in between the two lenses on the side of your phone display. The straps are pretty much identical and easy to adjust and the focus wheel remains on top. 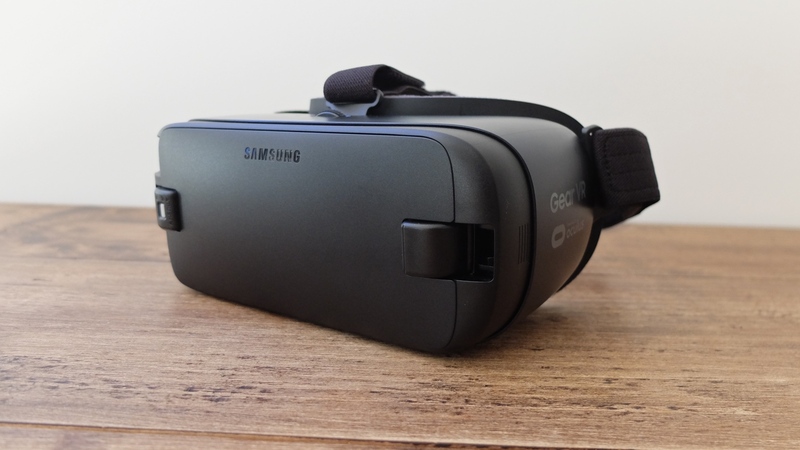 One more thing – the Gear VR does feel ever so slightly heavier than the first and it's also bigger, particularly wider in front to accommodate Samsung's larger Galaxy phones. Neither of these are noticeable enough to be a mark on the Gear VR's score though. The actual visual experience of using a Gear VR will depend on which smartphone you use, with Samsung, of course, nudging you towards the big and sharp Note 7 screen. But there are some improvements to the actual headset no matter which phone you've got – specifically Samsung has widened the viewing angle to 101 degrees (from 96 degrees) and darkened the colour tint to reduce glare and reflections. The new field of view is a welcome addition – it puts the Gear VR on a par with the Vive and Rift for this spec at least. But while this and the tint help with the immersion, it's not a real step up. And frankly, it doesn't need to be. This isn't a perfect picture, this is mobile VR and with these small upgrades Samsung still has the best mobile VR headset around. Another big new feature the Gear VR (2016) packs is a USB Type-C adaptor so in theory you can plug Sammy's newest handset straight in (if you ignore the current warnings from Oculus et al not to go near it in case of explosions). That doesn't mean that owners of S7 and S7 Edge phones are going to miss out on the improved virtual reality action. You can pop the USB-C adaptor out and swap it for a regular old Micro USB one. It's easy enough to do, a little module just pops out in the front compartment and you can slide it along (between A and B) to account for phone size. Just don't lose the adaptors. The full list of compatible Samsung phones are the following: Galaxy Note 7, S7, S7 Edge, Note 5, S6, S6 Edge and S6 Edge+. Samsung Gear VR (2016): Which headset? The 2016 Gear VR is – as before – well worth the extra money over a Cardboard viewer, mainly down to the app and video library. The only caveat now is that Google Daydream is about to drop and Samsung is involved, so perhaps wait until early October to make your decision. It's the one you'll no doubt end up buying if you don't own a Samsung mobile headset already, as the first one is showing as out of stock on Samsung's site. Which essentially means Samsung is replacing its first mainstream model – and in our eyes, that's no bad thing. If you own the first one, there's no essential reason to upgrade unless you get a USB-C phone or really want to say bye-bye to that fog issue. Still the reigning champ of mobile VR, the 2016 edition of Gear VR is weeks away from facing its real first rival – Google Daydream. We'd recommend waiting until October to see Google's plans and partners. Otherwise, this is still a neat, fun, at times mind-blowing Samsung Galaxy accessory with genuinely welcome design and tech tweaks plus a much larger and higher quality library of apps, games and videos than when we first reviewed it. Will Daydream kill Gear VR?